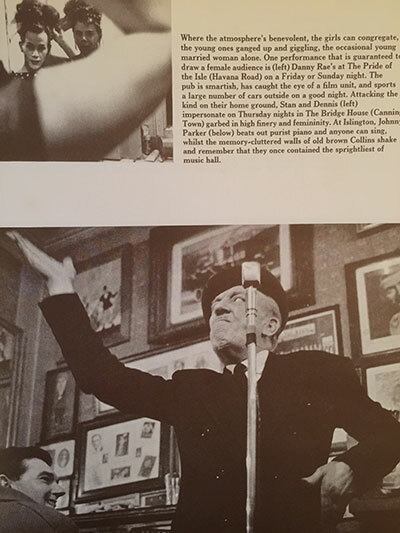 In 1964 ‘Drinks-man-ship, Towns album of Fine Wines and High Spirits’ was published. 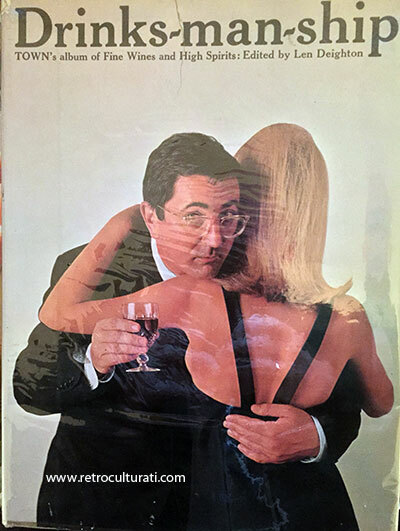 Edited by spy thriller and cookery book author, Len Deighton it is coffee table format book of articles covering wines, beers and spirits as well as a wonderful chapter on a London pub crawl written by George Melly. In this photograph we see Johnny Parker at ‘Collins’ in Islington Green, a former music hall where the walls are adorned with photographs of anyone who was connected with it. Johnny is seen here at the piano encouraging anyone to sing along. He’s in-between tours with Monty Sunshine and that particular lunchtime was very ‘lively’. In the photograph above Johnny are Stan and Dennis getting ready to do their act at on Thursday night at The Bridge House in Canning Town. Melly tells us that they ‘engaged in rather tired patter’. The crowd at The Bridge House come from the ships in dry dock nearby but its heyday has, like its deceased landlady, Madame Suki long since gone. What Melly gives us in a few short lines is a sense of change, a slow evolution of the pub and those who would frequent them. It was still a time of ‘entertainment’ though, it would be a decade before the fashion to make the home a place to stay and socialise would take hold. Television improved, access to credit for household improvements meant couples would begin to entertain at home more often and with it came the start of the slow, gradual decline of the public house. 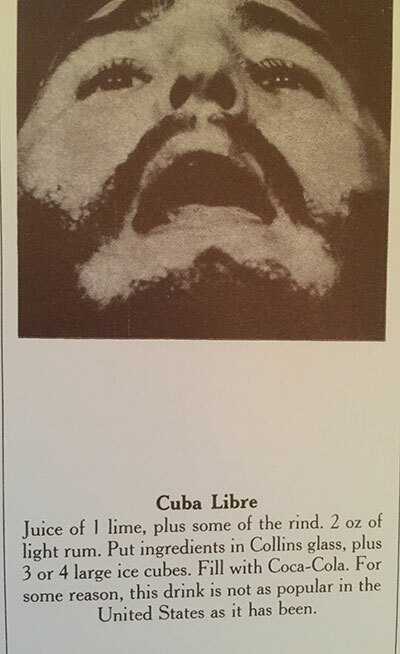 At the back of the book there is a drinks recipe section, here we see man of the moment, Fidel Castro above a recipe for Cuba Libre. For some reason, we are told ‘the best cocktails tend to have rather prosaic names. But part of the fun of cocktails is their meretriciousness’. Show me, if you can a modern day cocktail book with a sentence like that! 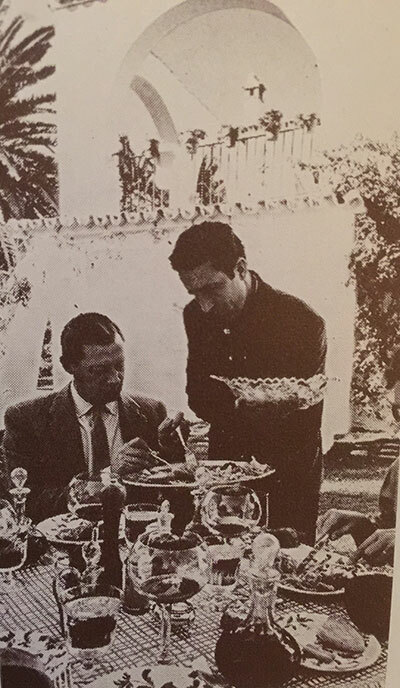 This wonderful picture of Beltran Domecq, then head of Williams and Humbert; sherry barons in the heart of Jerez ‘having lunch served on the lawn’. 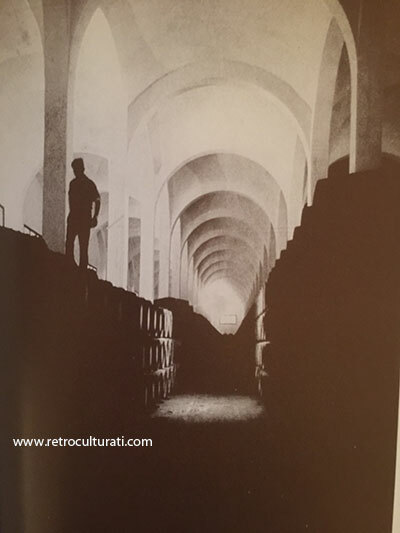 The book is full of wonderful snippets of drinking life in 1960s London, there are reminders of a lifestyle and culture sadly passed on. Pubs of character serving characters. What, we must wonder would Johnny and his fellow cronies have made of the themed bars and gastro pubs which now stand in replacement? Not much probably. Whilst there is much not to miss about some of these establishments they should be remembered for offering shelter and company to many people during difficult periods in which a drink, a smoke and the odd sing-a-long would prove their only solace.